Today we had a birthday party for my father, a great role model and teacher. He requested my baked beans. 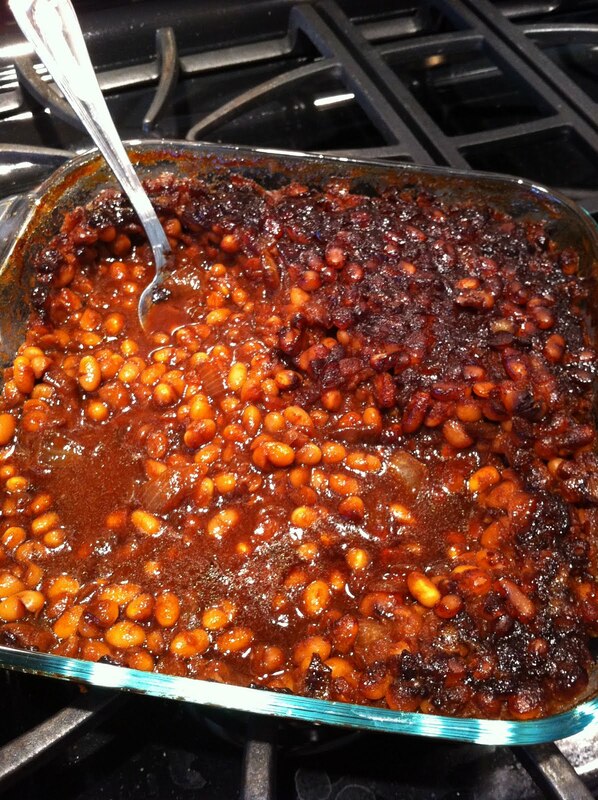 I have this recipe that I worked out from the back of the package of beans by simply leaving out all that is not vegan. Sweet and tangy with lots of extra sauce to wipe up with the pita we had on the table. It will be even better tomorrow! Soak the beans overnight. Drain, rinse, and cook for about 45 minutes. Drain. Set aside. In a small skillet, saute the onions until translucent and then add the celery until it cooks through. About 5 minutes. Set aside to cool. In a large mixing bowl, add tomato sauce, Dijon mustrad, molasses, maple syrup, Worchestershire sauce, and a dash of salt. Using a whisk, combine well. Then add the onion and celery mixture and the beans. Mix well. Place in a baking dish and bake for an hour. Serve with mustard and sauerkraut! Enjoy!